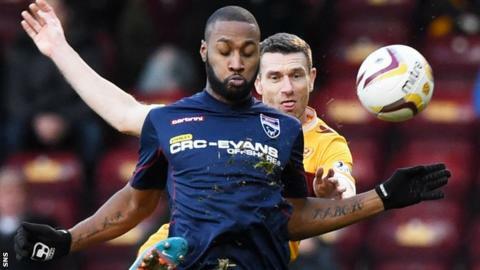 St Mirren have signed former Ross County striker Yoann Arquin until the end of the season. And the 26-year-old will go straight into the squad for Saturday's Premiership visit to Dingwall as the relegation-threatened clubs meet. "He will help us in the final third of the pitch with his link up play and also to stretch teams in behind," said caretaker manager Gary Teale. "We are hoping that with his strengths he can add much needed goals." The Frenchman scored six goals in 35 appearances for County, with two coming in 19 outings this term. And he had been criticised by Staggies manager Jim McIntyre ahead of leaving when his contract expired on 2 January. "I spoke with a number of people who I trust in football and they all gave me very positive feedback about the club and the fantastic facilities they have," Arquin told the St Mirren website. "I am looking forward to getting started on Saturday and hopefully help the club start to move up the league table." Teale, whose side dropped to the bottom of the Scottish Premiership table on Saturday, need cover up front after another injury to captain Steven Thompson. releasing Ross Caldwell and allowing Adam Drury to return to Manchester City after a loan period. Ryan Jennings, a 19-year-old striker with Wigan's development squad, has also been training with the Paisley side and could join on loan.